The accounting department of the organization should follow its suppliers invoices, documents and payments. Hyper provides its users with this tool, which allows to feed in invoices, in order to create bookkeeping entries and make payments. This tool is available from the supplier card and also from the Toolbox of the Bookkeeping Module. 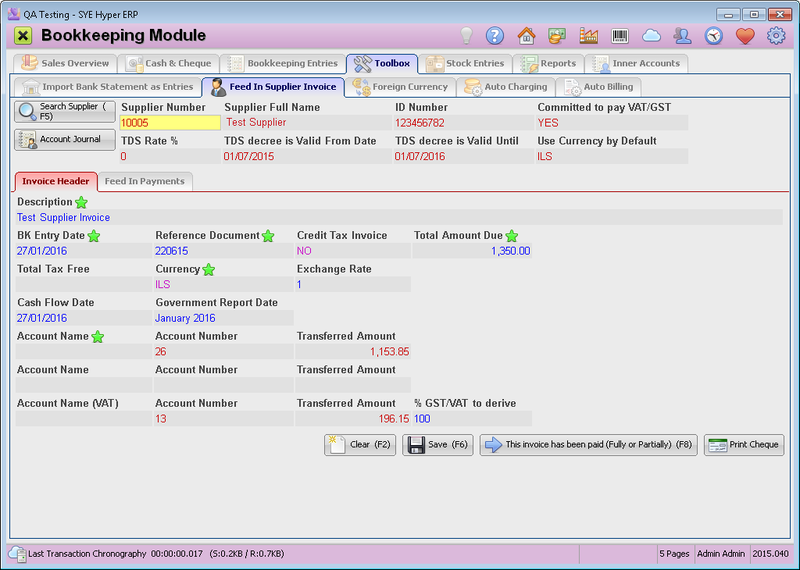 This tool allows to easily and simply feed in the suppliers invoice into Hyper's Bookkeeping module. This action is limited to one bookkeeping entry, but can be splitted to two accounts + one VAT account. The user can also feed in a "Multi Currency" invoice as will be described below. In order to feed in an invoice, press the Search Supplier (F5) and select the required supplier or B.K Account from the list. Press the Account Journal button will open the Account Journal of the selected Supplier or B.K. Account. In these fields, fill in the description and details of the invoice. Please note - the "Total Tax Free" field applies to the first transferred amount field. Clear Clear the fields of this tab. Checking bookkeeping entries from a time frame of 15 days before and after the BK Entry Date. The "Reference Document Type" must be "Supplier Invoice". Please Note - If the system finds a suspicious bookkeeping entry, according to the above criteria, it will display a message with the details of the suspicious invoices and will ask the user to approve / cancel the new bookkeeping entry. Choosing "NO" will reopen the "Invoice Header" to update its details. This invoice has been paid (Fully or Partially) This button will open the "Feed In Payments" tab. After filling the required details, press the Save button. Print Cheque This button opens the Print Cheque window, to fill the required details for the cheque. Define Bookkeeping in "Multi Currency" Mode - In the "Bookkeeping" tab of the System fundamentals, choose "YES" in the "Bookkeeping in Multi Currency Mode" field. Define Currency Swaps Default Account - In the "Bookkeeping" tab of the System fundamentals, choose the relevant account from the B.K Accounts list. This account purpose must be defined as "General (Daily Currency Value)". 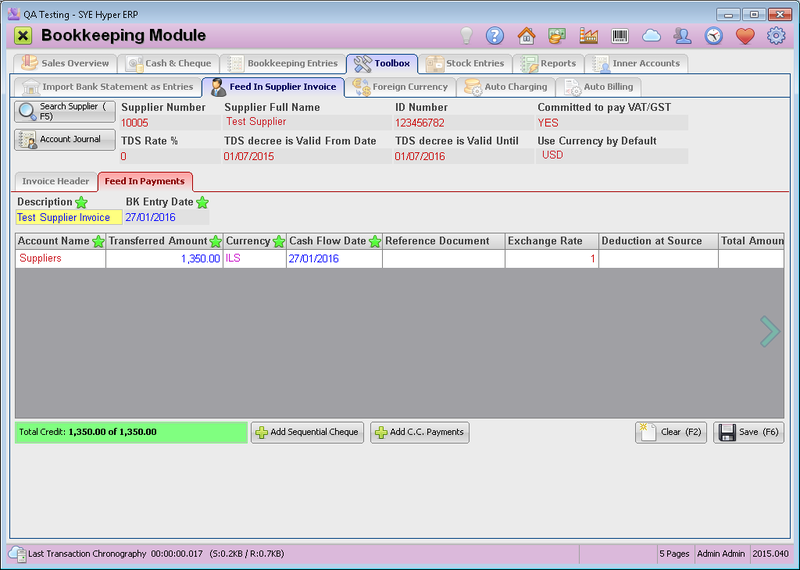 This tab is used for feeding in the payments for the suppliers of the organization. The two fields at the top of the tab ("Description" and "BK Entry Date") will be filled automatically by the system, according to the "Invoice Header" tab. These fields are available for editing. Fill in the fields of the table, according to the required payment. Additional row can be added by pressing Ctrl+Enter or by using the right button of the mouse and choosing "Add New Row" from the displayed menu. Each row will create a new bookkeeping entry. Add Sequential Cheque Automatically add an additional and sequential cheque record to the table. The "Transferred Amount" and the "Cash Flow Date" fields will be automatically filled and can be manually modified by the user. Add C.C. Payments Fill in the required number of equal payments. The transferred amount of each payment can be manually modified. Clear Clear the fields of the table. At the bottom of the payments table, the "Total credit" is presented, according to the Transferred Amounts of the table. According to the "Total Amount Due" field of the "Invoice Header" tab, the background of the "Total Credit" will be colored as follows: Red = the total credit is higher, Yellow = the total credit is lower, Green = the exact required credit. After updating the payments table, Press the Save (F6) button, in order to create the bookkeeping entry. This button is available only after filling all of the mandatory fields. The system will display a message with the bookkeeping entry number. The system will automatically bundle the the bookkeeping entries if the "Total Credit" is equal to the "Total Amount" value. It is recommended not to feed in Credit card or bank transfer payments, but to use the "Import Bank Statements as Entries" wizard. When feeding in a Credit Tax Invoice, the bookkeeping entries will be updated in Opposite sides (Credit and Debit).